Riki is the protagonist of Little Busters! 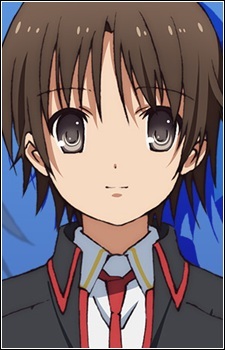 He is a member of the Little Busters, and of them, he is seen as the only one that is straightforward and has common sense. His parents died when he was very young, and around the same time he was diagnosed with narcolepsy. However, he is the only one who is straightforward, acting with the most consideration and common sense among his peers. Riki is also seen as the most dependable and reliable member of the group, as he is always willing to support his friends through personal difficulties, helping them face their personal demons. The world Little Busters! takes place in is actually an artificial one made for Riki and Rin so that they may grow stronger; In the real world, most of the characters were in a bus accident and only Riki and Rin survive in the first world they encounter the accident in. Riki proceeds to grow stronger by going to the source of his narcolepsy and fix it. Afterwards, the bus accident happens again and Riki, now stronger than before, manages to save everyone with help from Rin. Did you realize that many popular (and some not so popular) anime series that you've watched and enjoyed started out as visual novels? Here are ten examples of series that got their start as a game before becoming an anime.